You may have noticed. There are two blogging “techniques” that I use and that could seems a little strange or unusual (probably because I think I may have “invented” them — or maybe other people are using them under different names?). I call them retro-blogging and scrap-linking. When I write I usually first take notes, organize my ideas and write a draft in my notebook. Yes, a real notebook made of paper. You may see this as old-fashioned but I’ve been doing this since I am a kid. So it is tradition (or an habit) for me. I started writing in the sixth grade but the first “book of ideas” (IDA), as I called them, dates from September ’77 (I was in the third year of high school). I have over thirty of them. 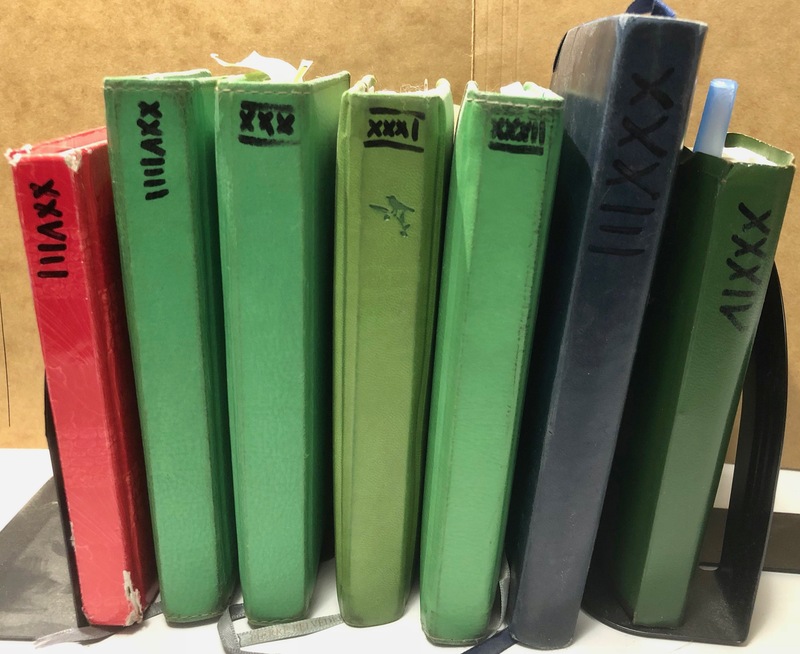 In the beginning, I was using larger size notebooks so I was writing not only notes, ideas, feelings, lists of books I read or movies I watched, but also poetry, short stories, essays. Today, I use pocket size notebooks for more convenience which are also quite useful for list of things to do and grocery lists! 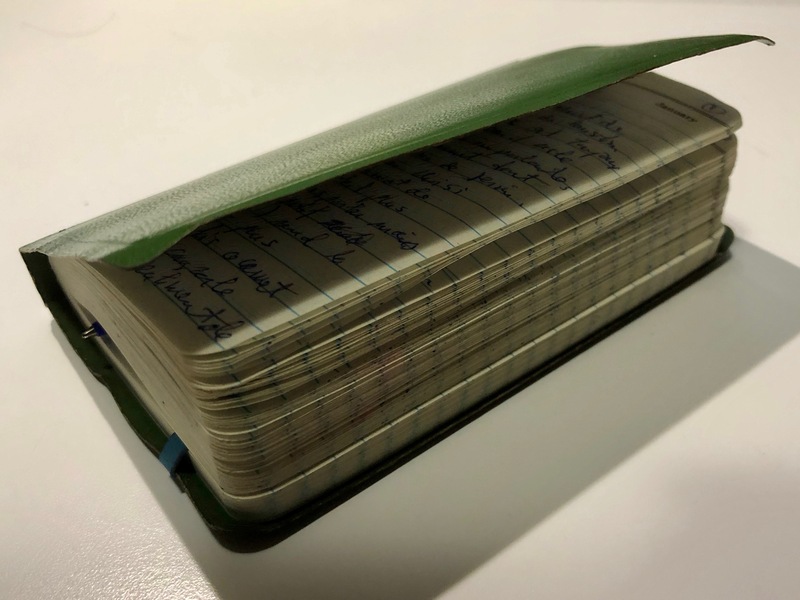 Of course, if notebooks are convenient to take quick notes in the bus or at work, it doesn’t mean that I turned my back on technology (I use WordPress isn’t it?). Pocket-size notebooks are good for short text like ideas and lists, but no so much for larger texts. Therefore, when I can sit quietly to write — at home, at work on my lunch break or in a café — I use the Apple “Notes” app (it’s part of iOS). It is also convenient since it syncs between all my devices (iMac, iPad and iPhone) through iCloud . When I finally have a satisfactory version of my text, I simply copy / paste it from the “Notes” app to the blog in order to share it. However, it can take days and weeks (or sometimes even months or years) for an idea or a draft to be finalized, polished, formatted (with links and illustrations) and ready to post on the blog. Retro-blogging is when I post a text to the original date it was created (drafted). So, let’s say I wrote an Haïku in my notebook on Thursday but was too busy to type and post it before Saturday. I will post it on the blog antedated to Thursday. Of course, I won’t use retro-blogging for text that older than a week (or exceptionally two) because it would be too confusing and hard to notice for readers. It is a way to spread over the entire week all the text written during that time instead of simply posting all of them over the week-end, packed into one or two days. It shows more regularity and assiduity in my blogging. Is that cheating?